From orphaned sloths to stray puppies, all kinds of Central America animals need your help. Whether you have a week or a year to spare, there's a Central America wildlife volunteer project that will fit your schedule (and skill set) perfectly. The Sloth Sanctuary of Costa Rica, south of Limon on Costa Rica's Caribbean coast, is home to more than 100 sloths, many of them orphaned youngsters. Volunteers get to play a hands-on role in the workings of the center -- including providing love for the impossibly adorable critters. Fees are $30 per day and include room and board. VIDA provides basic veterinary care, education, and free spay/neuter surgeries to the pets and livestock of Central America's working poor through veterinary mission trips to Costa Rica, Nicaragua, and Guatemala. While veterinarians and pre-vets are needed the most, anyone interested in animal welfare is appreciated. Guatemala's ARCAS Rescue & Rehabilitation Center ​receives between 300 and 600 animals of more than 40 species per year. Now the organization has branched out in other directions. 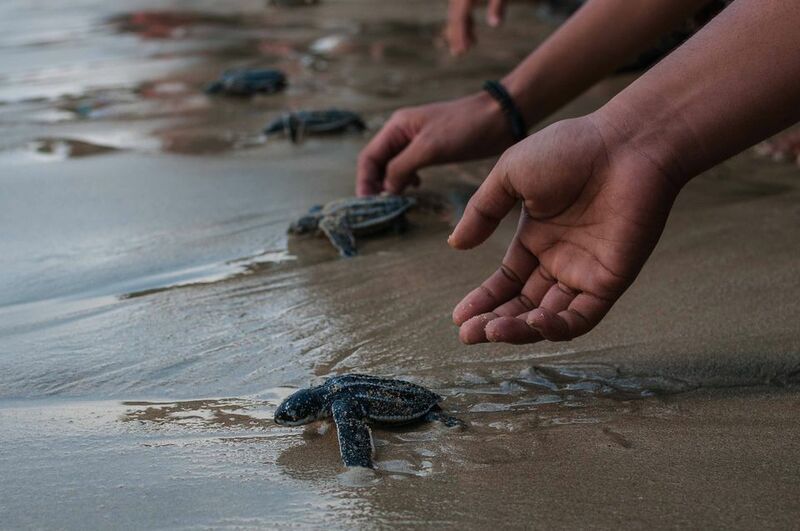 ARCAS needs volunteers at its Rescue Center in Petén, its Sea Turtle and Mangrove Program in Hawaii (a village on Guatemala's Pacific coast), and at the Senderos de Alux Environmental Education Center near Guatemala City. Work with Costa Rica's endangered sea turtles! Volunteers help by patrolling the beaches at night, guarding the hatchery, and supporting agricultural activities (mowing, sowing, digging and harvesting). Fees are $15 per day and include meals and dorm-style accommodations. Located on the verdant slopes of the volcano Baru in Boquete, Panama, Paradise Gardens is a sanctuary and rescue center for all kinds of Panama wildlife. Volunteers are needed to give guided tours to visitors, clean and feed the animals, socialize with the animals, and provide translations into other languages. Help prevent poaching of the eggs of endangered Leatherback, Green and Hawksbill turtles on the beaches of Barra de Parismina, Costa Rica. Volunteers patrol beaches, maintain laying habitats, count eggs and relocate them to ASTOP's hatchery. Iguana Station is located don Utila, part of the Honduran Bay Islands, and serves as an important part of local iguana conservation efforts. Volunteers work with the iguanas but are also needed in other capacities, such as teaching to carpentry work. The Belize Audobon Society is always in need of long-term volunteers (3 months minimum). The organization prefers those who have worked in developing countries, community development, teaching, tourism development, art, small business development, conservation or park management. Those experienced in diving are also needed for their marine program (1-month minimum). Volunteer Latin America provides information on free and affordable volunteer opportunities all over Latin America. Volunteer South America lists scores of volunteer opportunities in South America and Central America. Organizations are split into free and low-cost volunteer positions. Many include working with kids.